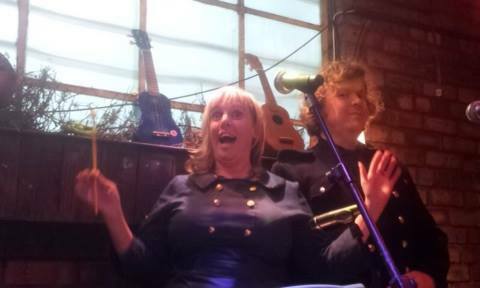 Marc writes: Last Friday, we played the second of our two Christmas gigs, this time at the Kazimier Gardens. Whereas our first seasonal performance had taken place in the reasonably sedate environs of Mello Mello, our Kaz show saw us braving not only the elements, but also by far the biggest audience of our career to date. This sage thought resonated with me as we awaited our call time on Friday - there was no way in which the vast majority of the crowd had come out to hear us (or to hear any music, in all probability). Was our carefully-wrought and rigorously-rehearsed set going to go ignored by the Quite Drunk (and rapidly getting drunker) audience? Once we took to the tiny timber-built stage and started playing, these fears were allayed. By some mixture of luck and Ruth’s pre-gig schmooze with a couple of audience members, there were a fair few people in front of the stage who seemed pleased to see us and cheered and clapped between songs. Add to this the touching presence of a good few friends and wellwishers and it’s fair to say that although most of the audience weren’t paying that much attention to us, a vocal minority were. Things We Learned, pt 1: An outdoor gig is not the best environment for subtlety. The songs which got the best audience response were the louder and pacier elements of our set, eg Gaudete fared better than I’ve Got My Love to Keep Me Warm and the biggest cheer of the set was reserved for the end of Adam Lay Ybounden. Looking out from the stage and taking in our surroundings, I had the thought that this was the nicest venue I had ever played - the outdoor space, which has a kind of Mediterranean feel during its summer season, was decked in fairy lights, and scented by a gorgeous combination of mulled cider and woodsmoke (Incidentally, I’ve seen sound engineers desert the desk during a set before, but never seen one returning with an armful of wood to burn.) The whole place combined the very best bits of a summer festival with a Bonfire Night party and outdoor Christmas drinks. I think as more and more venues, like this one and Mello Mello, put such care and imagination into their decor and ambience, the harder it will be for the lazy ones to keep being as bad as they are. As the gig continued, all those who were with us at the beginning stayed attentive, and a fair few others seemed to be enjoying the music. This being a Christmas-heavy set, there were quite a few well-known songs and it was lovely to hear people joining in. The highlight of the set, for me, came when Ruth sang her a capella solo piece, Adam Lay Ybounden. Not only did the audience listen during the first verses and join in enthusiastically with the speedy-up clapping in the song’s second half, but two audience members executed an elegant (if slightly pissed) pavane right in front of the stage. I watched this, and listened to Ruth’s beautiful, clear voice and felt very happy. So overall I think it’s fair to say we were both very pleased with how the gig went. The past week has been fascinating, performance-wise, as we’ve played very similar sets in two completely different environments; an indoor gig with people sitting down and listening, and an outdoor one with lots of rowdy drunk people. Personally, I think I enjoyed The Kaz more, if only for the novelty of the environment. Equally, I have a feeling that the delight of playing to audiences that plastered and numerous could pall fairly quickly. For that one night, though, it was very special indeed.